Collecting feedback online is a crucial and must-have utility that'll help you improve whatever you're doing online. There are many complex tools out there which collects feedback for certain situations but if you need a simple button to get the job done right, here are the steps on how to create your very own feedback button in minutes. 2. Add fields to your feedback form and save it. In the example below, we used Email and Text Area fields. 4. 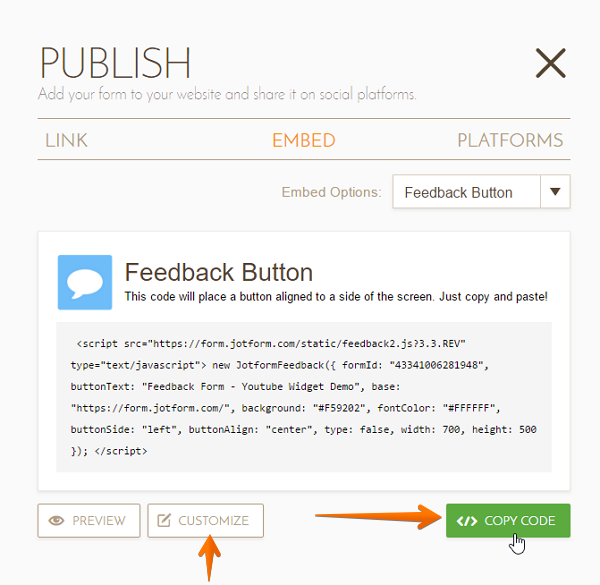 Click on Embed section on the left side and then Select Feedback Button to get the embed code. 5. The Preview button shows you what your button will look like. You can customize the appearance and behavior of the feedback button by clicking on "Customize". 6. Copy the entire code and paste it to your website where you want it. You're done setting up your feedback button and form in just a short time. If you had difficulties creating or embedding your feedback button, please share it on the comments section below. I used following steps and create feedback form but when i copy paste on my coding it's not working. plzz help me.I am new to webdesign. Is there any other code required for this form?? And why at the bottom of the feedback form JotForm add is shown?? There is more easy way for that. You should try BugRem.com. I want to create a feedback form, when customer writes a review it should be published on my website, how can achieve that. finished my feedback button and form, however where do I paste the code??? Why can't you add your own picture as feedback button? I really like this but it's not being responsive in mobile or tablet view. How do I make it responsive? If not that, then how can I make it hide in mobile and tablet views? 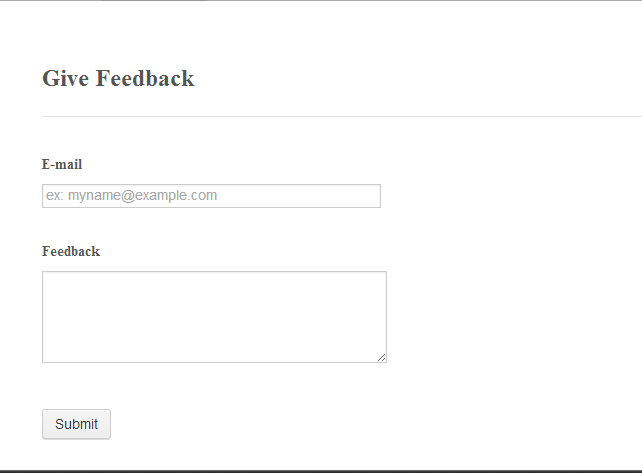 I'm trying to embed a feedback button on another JotForm form, is this possible and if so how to go about it? Can't figure it out. Is it possible to resize the button and/or button text? Is it possible to add the url for the page the button is on to the form? I see how to do that with standard embeds but it doesn't seem to work with this feedback button. how comes am not getting any feedback from the mail address i gave out to receive from??? How can I design the form, width and alignment of a button? Is there and 'add field' button?